By this point in the season, you've probably exhausted your summer wardrobe to the point of no return. Chances are your favorite summer essentials have gotten more than their fair share of exposure on your Instagram feed. But before you retire them to the depths of your closet until next spring, hear us out. There's no need to completely ditch items like a slip dress or a crop top. Instead, maximize your summer pieces while transitioning your looks seamlessly into fall. 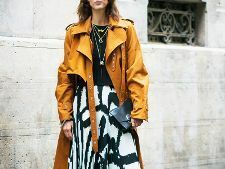 We've highlighted four summer-to-fall outfit combinations that are a no-fail way to feel fresh for fall without splurging on an entirely new wardrobe. The trick to transitional dressing almost always lies in the art of layering. We love how these stylish women are pairing spaghetti straps over ribbed knits and long wrap dresses over cropped jeans. There's no limit to the combinations that can be done. Ahead get inspired by these four summer-to-fall outfits that stylish women love to wear, and shop each look. What's your go-to outfit formula for transitional dressing? Show us by tagging your summer-to-fall outfits on Instagram with #WhoWhatWearing.